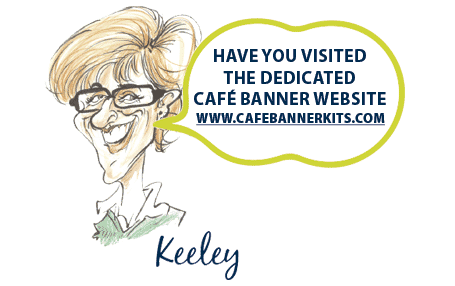 What is a Café Banner Kit? It is a system designed to define, divide or enclose outdoor or indoor areas. This is achieved with printed graphics or canvas banners attached to robust cross arms, which are supported by heavy duty posts. Using one of our Café Banner Kits helps create a unique environment, configuring your outside space to suit any situation. 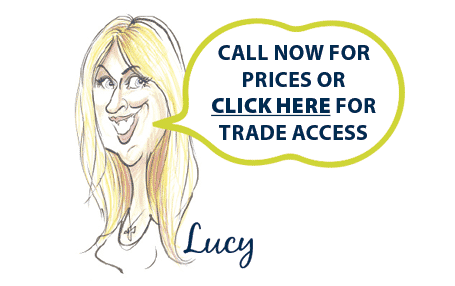 It is also an added opportunity to advertise on your Café Banner graphics. Making them colourful, eye-catching and even adding your own logo brand will attract the consumers attention and ensure you stand out amongst the rest. With the heightened amount of alfresco dining and drinking, making use of your outdoor space has never been so important. 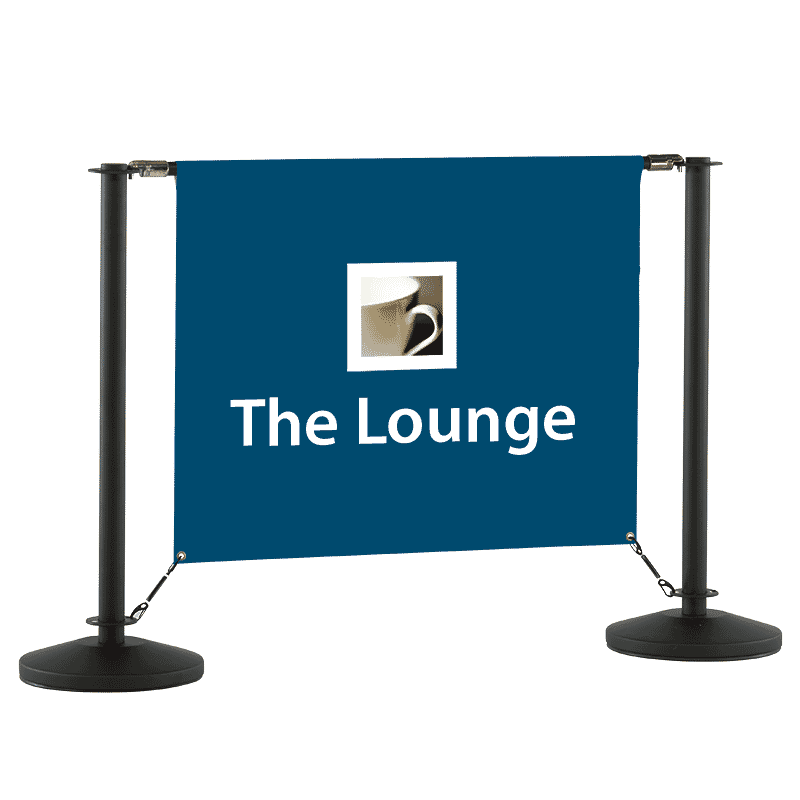 Café Banner kits offer a flexible solution to defining your boundary. 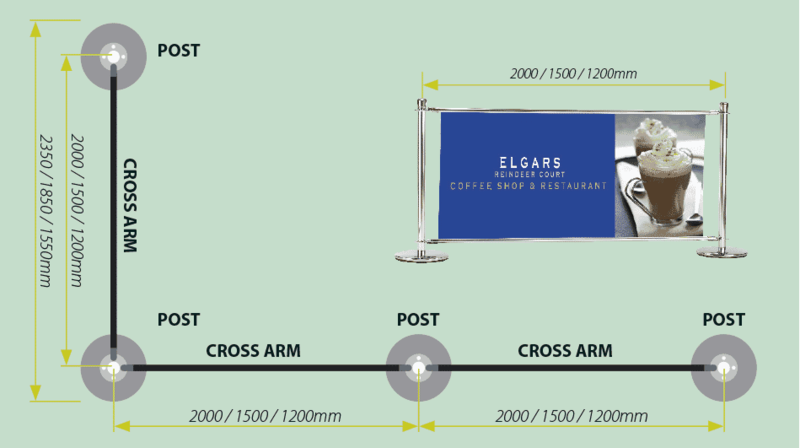 With the increased popularity of our Café Banner Kits and the number of queries regarding them, we at Plex have compiled a list of the 5 most crucial Café Banner points to consider when choosing a Café Banner Kit. The most important thing to consider is where the kit is being used – indoors, outdoors, sheltered area, exposed area, high traffic areas etc. 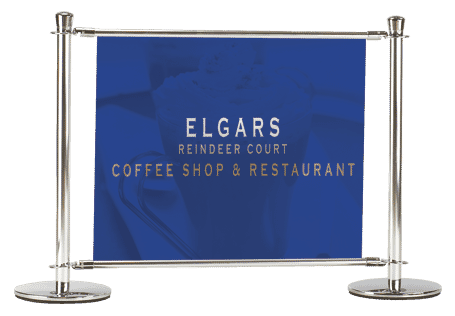 Certain café banner kits are more suited to specific areas; for example, exposed or high traffic areas would require the heavier 18kg post and base, whereas sheltered outdoor locations would need a minimum weight of 10kg. 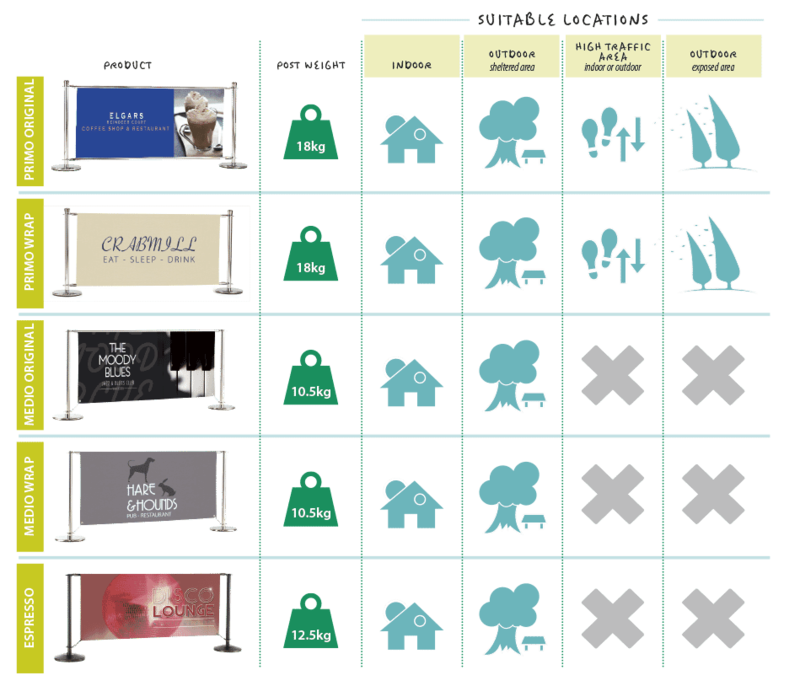 Any outdoor areas can be affected by gusting winds so it is recommended that a suitable wind permeable banner is used where necessary. We suggest that indoor graphics would suit a PVC banner and for outdoor use a vinyl mesh banner which is a type of material that allows wind to pass through the Café Banners. The length associated with each cross arm refers to the distance between post centres when the cross arm is attached to the posts. 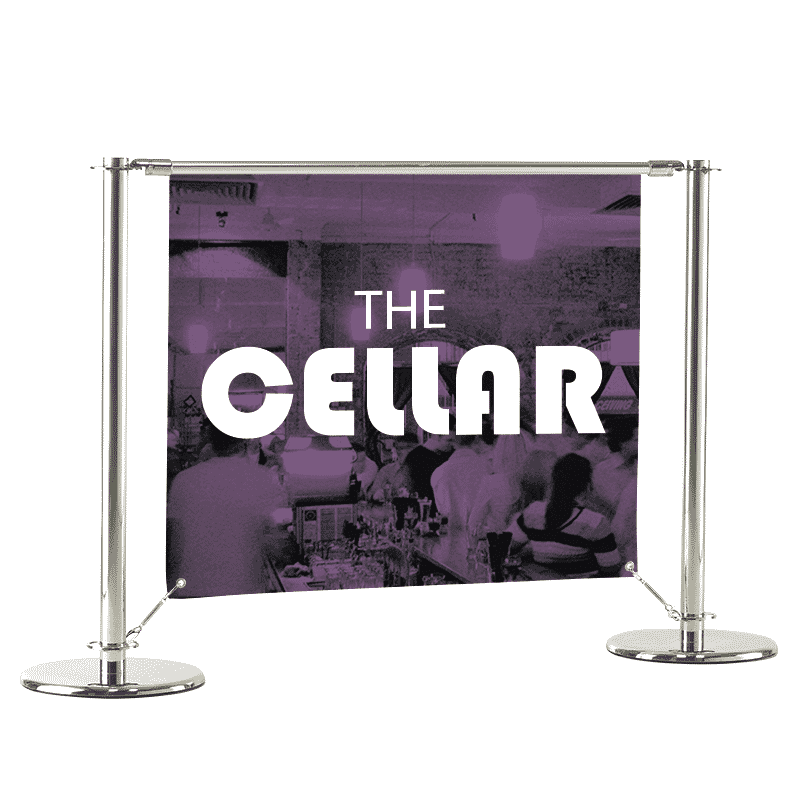 Our café banner kit cross arms are available in three lengths; 1200mm, 1500mm and 2000mm. Each cross arm needs to be connected to a post (at both ends). If required, 4 cross arms can be connected to each post. Therefore, corners and straight lines can be created. As an example this diagram shows a configuration made up of 4 posts and 3 cross arms. All local Councils have to ensure that the public’s right to use a highway are not detrimentally affected. Public highways include footpaths, pavements, market places, parking spaces and verges. Councils usually class an area of the public highway where tables and chairs may be used or food and drink is consumed as Pavement Cafés. A lot of Council’s are generally supportive of Pavement Cafes because it facilitates enjoyment in the local area, encouraging people in the towns and villages to interact and make the best of the County’s great offerings. Generally, all parts of the public highway may be used for Pavement Cafés as long as all safety and non-obstruction requirements are met. Each local Council will however have their own guidelines. Some require you to fill out Pavement Café application forms for a ‘Pavement Café Licence’, whilst others require you to obtain planning permission and/ or listed building Consent (This will usually be from your Local Planning Authority). With any of these scenarios there will usually be fees. Remember each County Council will have their own rules and guidelines. If you wish to serve alcohol at the Pavement Café you will undoubtedly need a liquor licence from your Council’s Licensing Authority. A local Council will sometimes undertake an assessment of suitability based upon the size and location of the area in which you plan to have a Pavement Café, it will also take into consideration the width of the footway and other surrounding businesses input. 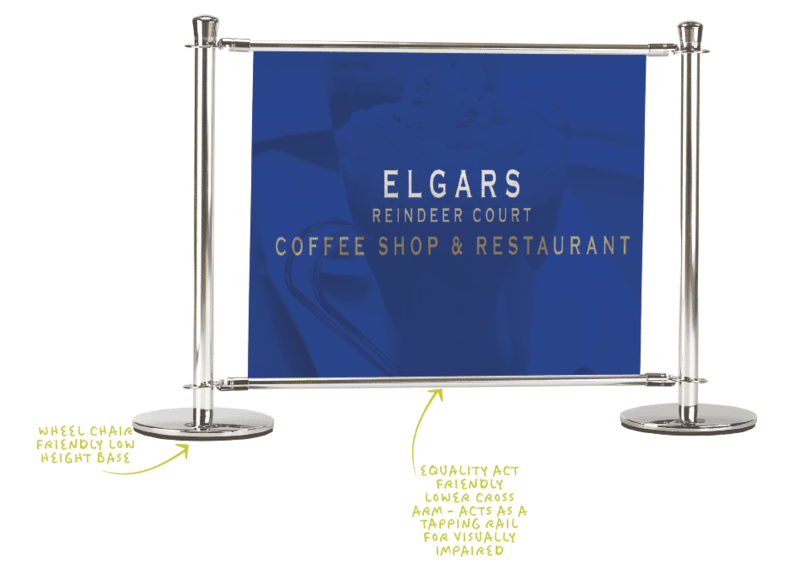 Section 115.E of the Highways Act 1980 gives Local Authorities the powers to licence and regulate items such as Café Banner Kits displayed on public highways. Please click here to view this. The role of the public highway is to allow the public to pass and re-pass so when using Café Banner Kits they must be managed and maintained in a way that protects the rights and safety of all users with special attention to wheelchair users and those with impaired vision which leads us into Point 4. Is an Equality Act (formerly DDA) friendly Café Banner kit required? If so, the Primo kit with it’s wheelchair friendly bases and lower cross arm is ideal. The shallow post bases allow the wheels of a wheelchair to easily roll over them and the lower cross arm acts as a tapping rail for the visually impaired. Cost is always a major factor to consider and that is why we offer a range of Café Banner Kits to suit any budget. Our Primo range is our premium kit with a polished chrome finish and a heavy 18kg post and base whereas our Espresso range, even though it is unique and very popular is at a great low cost for great quality with its sleek black powder coated post and base and strong, durable cross arms. We hope that you have enjoyed reading our Café Banner kit blog and that it has answered any questions you may have had regarding what to consider when choosing the right kit. If there is something you can’t see please ask! Please Click Here for our range of Café Banner Kits, which include spec and assembly downloads, including graphic panel sizes.